Time flies! Only 6 weeks left till I leave for the Gambia. 6 weeks!!! The last four weeks have been busy and fun! The weekend after the Wine Tasting event on March 22nd, I was off to Hamilton for the Around the Bay 30 km road race; my 7th consecutive Around the Bay, the oldest road race in North America. The night before the race, the weather was terrible. There was a snowstorm and the winds were so strong that the snow was falling sideways. Gen, my friends and I were all expecting the weather on race morning to be a challenge. Luckily, it cleared up on race morning; the roads were dry and the sun was shining. I ran with my friend Shauna. Shauna and I first met over seven years ago when we were both training for our very first marathon. I couldn’t find her at the start line but found her 1 or 2 kilometres into the race. A few days before the run, I was severely sick with a 24 hour stomach flu. I had very little time to get myself in tip top shape but I was determined to run the race. Although I felt fine for the first 21 kms, after that, things fell apart. I didn’t tell Shauna, I just let her go at 21 km and slowed down my pace. I felt dehydrated and not my usual self. I drank extra liquids at every water station after that. I pushed on. I ran up the famous hill right up to the top. I high fived the guy dressed as the Grim Reaper at the top near the cemetery. He’s there every year and hurls insults as we run by. It’s a tradition. I finished my race with a personal worse for this race. I wasn’t disappointed as I was able to push on and finish. It puts things into perspective when you see a fellow runner being carried away in a stretcher less than a kilometer from the finish line. How I wish I could have helped him to the finish. Five days later on April 4th, Gen and I drive to the airport in Montreal. We are Amsterdam bound! I sleep very little on the plane. We arrive before 8 am Amsterdam time. We pick up our rental car and I drive us to Bruges. I feel surprisingly alert and awake for the 2h45 drive to this small medieval city in Belgium. We arrive at around lunchtime. We park the car, check in to our hotel and head out to explore this amazing place. 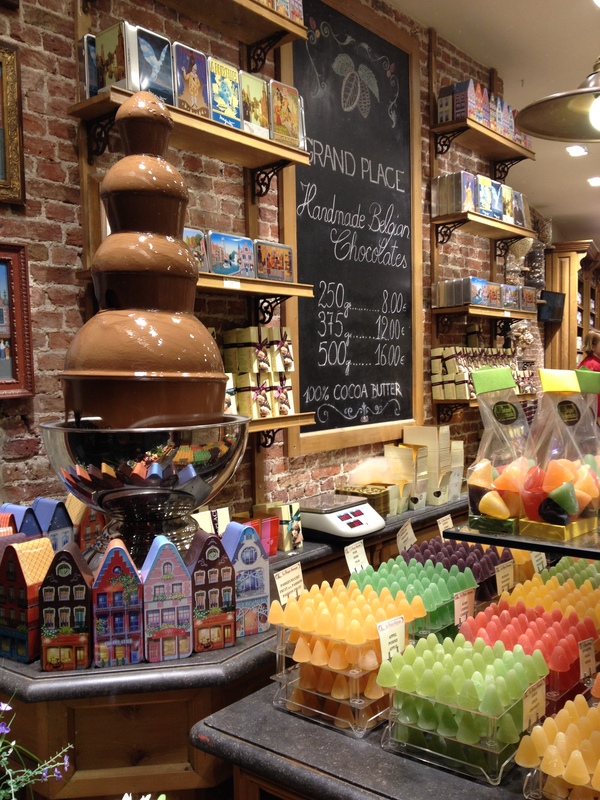 There are chocolate shops after chocolate shops. I think I’ve found heaven. We stay up for over 37 hours. We sleep well on our first night in Europe. After a wonderful visit to Bruges, we drive back the next day and return the car. 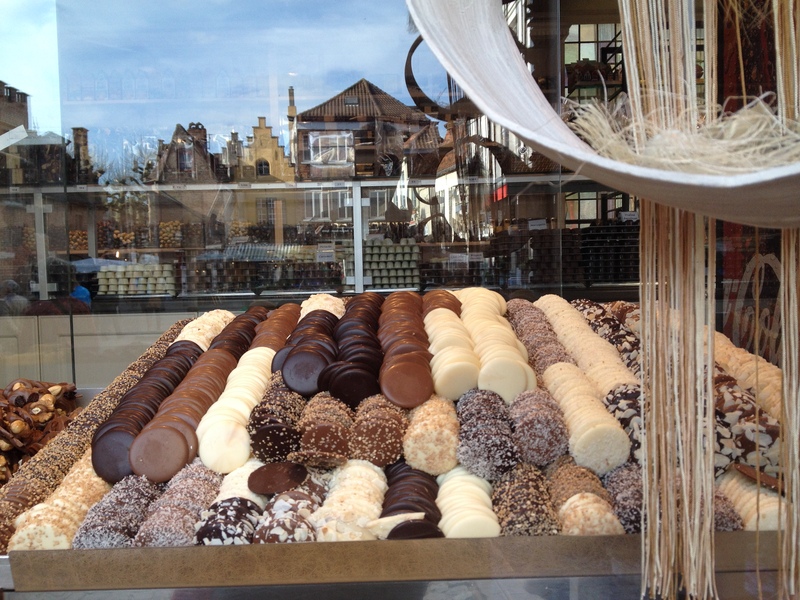 We spend the next four days in Amsterdam and the following four in Rotterdam, the Netherlands second largest city. We spend an incredible amount of time on our feet visiting the sites and even with good walking shoes; our feet are sore and tired every night. But we wouldn’t have it any other way. There will be time enough to rest when we get back home. My one worry from all this walking is how it will affect my marathon. 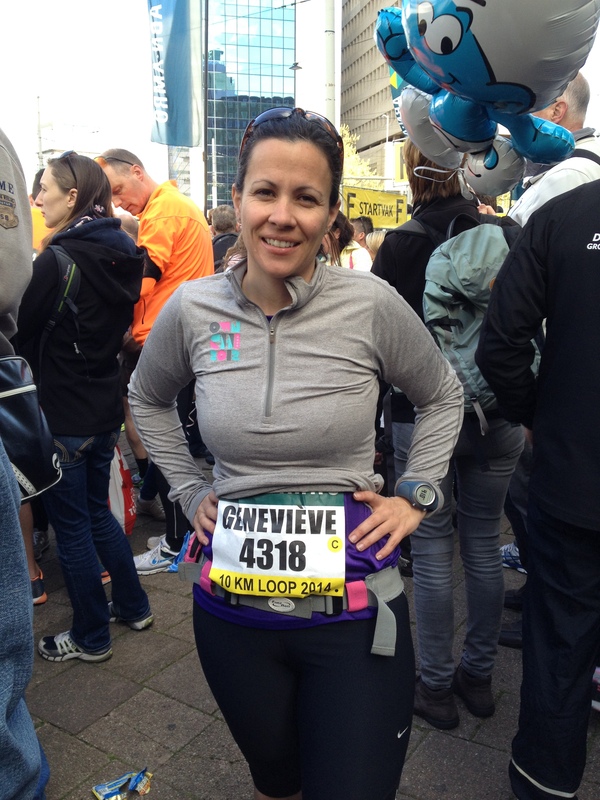 Gen is running the 10k and she too wonders how it will affect her race. 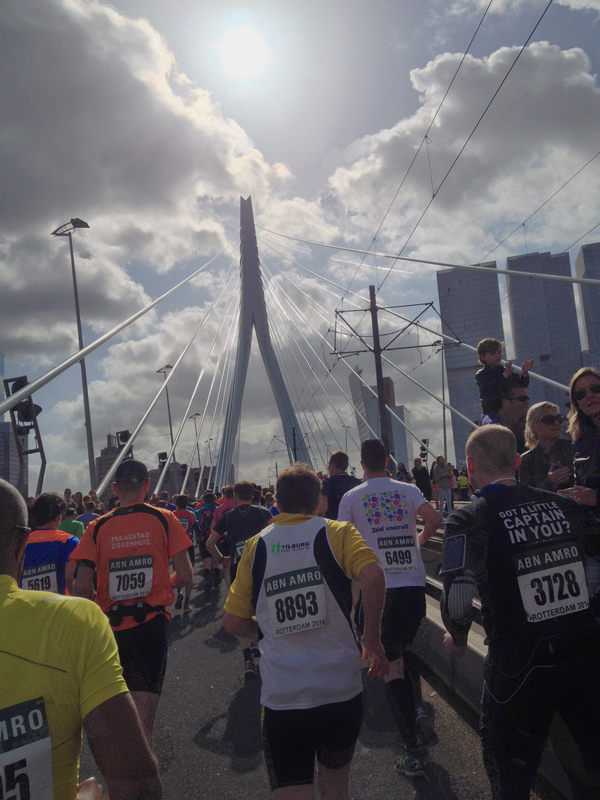 April 13 – Rotterdam Marathon – It’s race day. The race start is late. 10:30 am for the marathon. The 10 k leaves 15 minutes after the marathon start. My legs feel fine. I hydrated well the night before. The sun is out, it’s warmer than what I’ve been used to back in Canada but there’s a mild cool wind that makes this day practically ideal to run a marathon. The canon nearby is fired – it’s time to run. For the first 10-15 kilometers I run regular “systems checks”. The legs feel fine, I feel good and so I keep a good pace. My goal is not to run a personal best but to finish strong and to enjoy the run. It’s fun running a course for the first time. I have no idea where I’m going. I just follow the runners and the signs. I understand nothing of the cheers – the Dutch language is a difficult one to grasp. 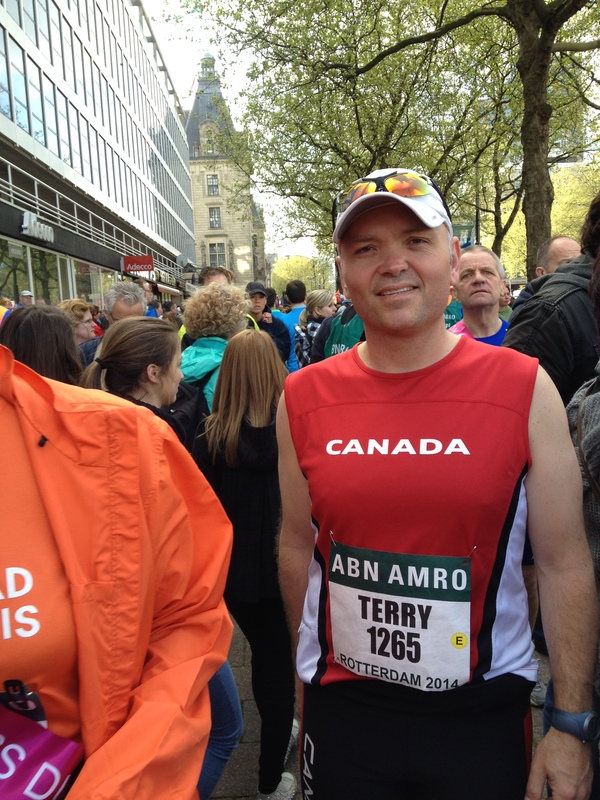 I am happy to hear many simple “Terry!” being yelled throughout the race (my name is on my race bib). I also get several “Canada!”. The further I get in the race, the happier I am that all is going well. The daily walking marathons Gen and I undertook over the last week have not impacted our running. A few times during the race, I think to myself how fortunate I am to be able to do this and to be running in Rotterdam. My pace slows down in the second half, I feel that the effort is the same as before but the speed isn’t there. I’m not worried. Physically I feel fine and that’s what’s important to me. This isn’t the time to fret about time. I keep going as fast as I can without over exerting myself. I try to keep enough in the “tank” to overcome anything that might pop up along the way. It’s a balance of speed, comfort (if there is such a thing during a race) and enjoyment of the race. I cross the finish line in 3 hours and 55 minutes. Not my faster time but not a bad time either. I’m just so thrilled things have gone so well. I pickup my medal and walk through the crowd to my hotel. I arrive at the hotel and moments later, Gen arrives. I am so pleased to hear that she had a great race. She too was not affected by all the walking. She ran a personal best! What a great finish to our trip to Bruges and the Netherlands. We fly back home the next day. Next up: The Bluenose Marathon in Halifax! I can’t wait to run this race! If you want to be part of Team Love4Gambia let us know! We’ll get you connected. You can run the 5k, the 10k, the half or the full marathon and raise funds for the NSGA! Next fundraising event: Comedy Night at Yuk Yuks on Thursday May 1! Tickets are $20. Let me know if you want tickets! 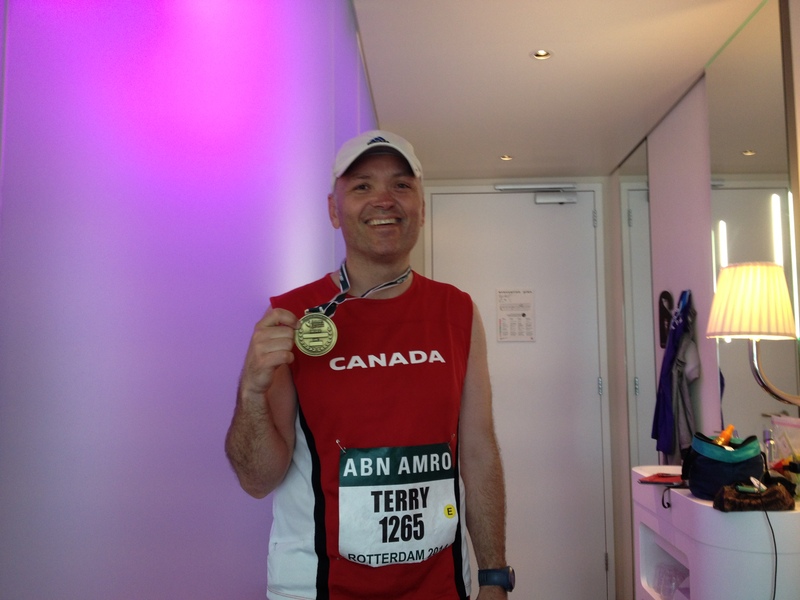 This entry was posted in Uncategorized and tagged Amsterdam, Around the Bay, Belgium, Bruges, Hamilton, Holland, Rotterdam Marathon. Bookmark the permalink.